Brand new arrival in the Armourgeddon Collection- we have acquired a WC54 US Army Ambulance to join the tanks, vehicles, jeeps, trucks and other interactive memorabilia in the Armourgeddon Museum. Take a read of this week's blog to find out more about this fantastic range of vehicles. We have a new addition to our fleet here at Armourgeddon: a Dodge WC54, member of the Dodge WC series, working as an Ambulance in US military service throughout World War II and as late as 1953 during the Korean War by the US Army Medical Corps. The Dodge WC series was a range of light 4-wheel drive and medium 6-wheel drive military utility trucks, produced in large volumes by Dodge and Fargo during World War II. Together with the quarter-ton jeeps produced by Willys and Ford, the Dodge WC series half and three-quarter ton vehicles covered nearly all of the light 4-wheel drive trucks supplied to the US Army in WWII, with Dodge contributing 337,500 4-wheel drive units! Previously jeeps had been highly standardised as they rolled off the factory floor, with modifications to fit requirements achieved by the field-based engineers. The Dodge WC, however, came in purpose-built variations directly from the factory. Evolved out of an extended family of trucks, with commonality of parts, the Dodge was created for a variety of uses: open and closed cab cargo and weapons carriers, command cars, reconnaissance vehicles, telephone installation trucks, panel vans, fetch-it-carry-it utility jeeps, mobile workshops and, as our new recruit was intended- as ambulances. Initially called the VC series, built from 1940 – 1942, the trucks soon required more variants and the WC series was created. WC was not an abbreviation of ‘Weapons Carrier’ as it is often mis-represented as, rather the WC were codes for the models. Initially W meant 1941 and C referred to the half-ton rating. However, the WC code was retained for both the three-quarter and one and a half ton 6x6 Dodges and well as for the models of the subsequent years. 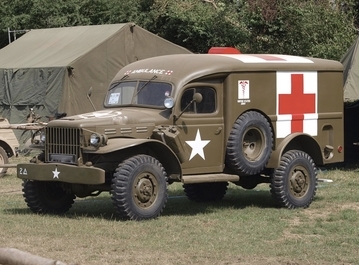 The WC54 three-quarter ton was a 4x4 light truck, serving as the main ambulance used by the US army from 1942 to 1945. Some of these ambulances served as late as the 1960s for other armies of European countries. The WC54 was based on the ‘Beep’ Dodge chassis, featuring a longer wheelbase and adjusted suspension to make its ride softer- quite vital for the patients in transit! The body of the truck was closed sheet-metal, made by Wayne Body works. It had room for a driver, a medic and up to seven patients. If the patients required stretcher transportation, this reduced the load to 4 plus the driver and medic. A large matrix cab heater was fitted to the firewall to provide comfort for the patients and a step on the rear to assist access for the stretcher bearers and injured personnel. From 1942 to 1945, 250,000 three-quarter ton Dodge WC-series trucks rolled off the production line. Of these, almost 30,000 were ambulances- 26,002 of which were in the WC54 specification. The Dodge WC54 here at Armourgeddon is thought to have seen WWII action before being restored by an independent collector. The jeep has been a regular at military re-enactor events and shows across the country in recent years and we are delighted for it to join our collection here in the museum. The fold away bunk stretchers in the back of the truck are intact and show how patients would have been transported from battle fields. The WC54 will be available to view in our museum when we open for the tank driving season. The Museum on site at Armourgeddon is open from Wednesday to Sunday, including Bank holidays from the beginning of April until the end of October, 10am and last entry is at 4pm. 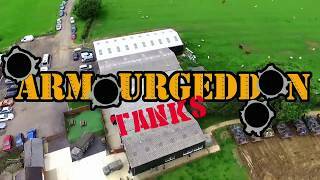 If you would like more information about our military collection and the Armourgeddon museum, please view our museum page on: Museum Page. Best day ever! Can not wait to do it again, cheers Shane owe you a beer ??? ?